Before the season I looked at HR rate by pitch location and noted batters who hit HRs in locations most do not. One batter I profiled was Carlos Pena, as he hits HR predominately on pitches away while most batter hit them on middle-in pitches. Part way through the season he was one of the league leaders in HRs so I did a follow up. Now he is out for the season with two broken fingers, but is still leading the AL in HRs. So I thought it I should check on where the pitches he hit his 39 HRs were in the strike zone. Here are all of his HRs plotted over the grayscale rate for all LHBs. Most of his HRs are the outer half of the plate, with a big number on the outer quarter where most LHBs hit very few. In the middle-in section where most LHBs have the most HRs he has surprisingly few. I talked in the original post about one problem with this method. I am comparing the rate of HRs hit by the average batter to the actual number for Pena, not his rate. Maybe he has few HRs inside because he gets few pitches there. To get around this below I plot the HR/FB rate for an average lefty and for Pena based the on horizontal location of the pitch. So it does in fact look like Pena gets much more power on the outside of the plate than the average lefty, and actually less than the average lefty on the inside quarter. In my post in the middle of the season Rich asked how he did this. Most batters have more power on pulled balls and pull more inside pitches. So is Pena's outside power from opposite field power or from an ability to pull outside pitches? To examine this I took inspiration from Max's work looking at relationship the between the horizontal location of a pitch and the horizontal angle of the resulting ball in play. In this case I just looked at Pena's HRs. Remember that -45 is the third base line and 45 is the first base line. Pena has hit only a handful of opposite field HRs, all from pitches away (I checked those are all on fastballs). But the bulk of his power is from hitting pitches on the outer half and even quarter of the plate to right field. He routinely pulls HRs on pitches on the outer edge of the plate. Pena is a great story. He kicked around for years before busting out with the Rays two years ago. We will see if the lead he has in HRs in the AL holds up over the next couple weeks. You're a wizard w/ R. That last figure is sweet. Dave - this is terrific. I would be interested to know if there is work out there incorporating where the batter stands in the box. As you probably know, Pena is known to crowd the plate. Great point. I meant to talk about that and forgot, but I think you are right that where he stands in the batting box and his stance in general plays a big part. "But the bulk of his power is from hitting pitches on the outer half and even quarter of the plate to left field"
I think you mean right field. good catch, thanks. I changed it. I think something else worth pointing out about Pena is that at one point he had more home runs than he did singles (36 vs 35) which is stunning! He finished with 41 singles, 25 doubles, 2 triples and 39 homeruns, only 2 home runs shy of his singles. I believe it would be instructive to break down his HR by pitch type, location, *and* handedness, if possible. Sliders from RHP would be breaking toward Pena whereas sliders from LHP would be breaking away from him. It's much easier to pull an inside pitch or an outside one breaking toward you, albeit the latter is a difficult proposition in an absolute sense by all but the strongest and best power hitters. I had not thought about pitcher handedness, but I did try to make a version of the last plot with the lines different colors for the different pitch types. The pitch type color version gets really busy going between middle-away and right field so that it was not clear to me that it added much information. But here it is. I will separate out by pitcher handedness and see what happens. Here the graphs are broken up against LHPs and RHPs. As expected many fewer HRs against lefties. There are a lot of HRs off sliders from lefties, against as expected since sliders are thrown more in lefty/lefty and righty/righty at-bats. All of the HRs off lefties were from the middle of the plate (but more middle-out than middle-in) and they were all pulled. Against RHPs it looks very much like the over all graph, just with fewer sliders. Good stuff. Pena sure pulls LHP no matter the location or pitch type. Very interesting. Given that Pena strikes out as often as he does, I wonder if he pulls off pitches and either hits them to right or swings and misses? A contact hitter is much more inclined to go with the pitches. Pena is so intent on hitting home runs that he sacrifices contact for power and, therefore, winds up pulling pitches or missing them altogether. Is there anyway of determining what his contact rate is on outside pitches (especially as it relates to other locations)? Dave, great, great choice for the charts! Very interesting stuff. 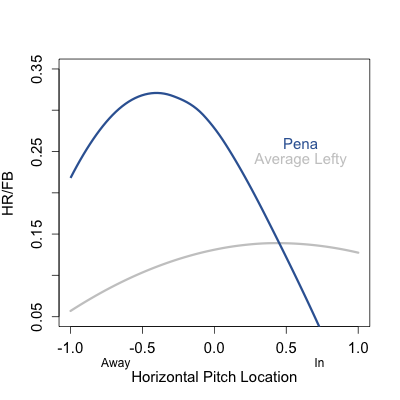 But the graph comparing Pena to the "average lefty" may be misleading. 145 lefties have hit at least one HR this year. 54 of them have less than 5. 82 have less than 10. Most of these guys aren't power hitters by any stretch of the imagination. If you limit the comparison to other sluggers (say, AB/HR less than 25) I think you'll get a graph that looks quite different. Would you do a similar analysis on Joe Mauer please? 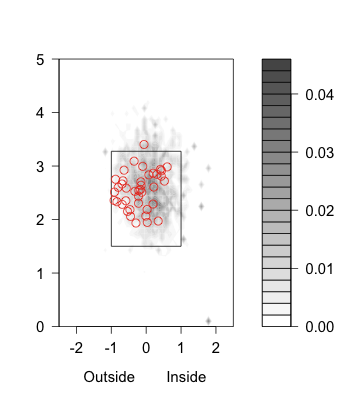 Contact rate by pitch location and a comparison to other left-handed power hitters rather than all lefties would be do-able, and I think very interesting. I have a pretty busy weekend, but if I get a chance I will do that and throw the graph up here. Thanks for the comment. I don't think I would have had the idea to do that had I not read your 'Hitting where the ball is pitched' piece, so I am glad that you liked the graphic. 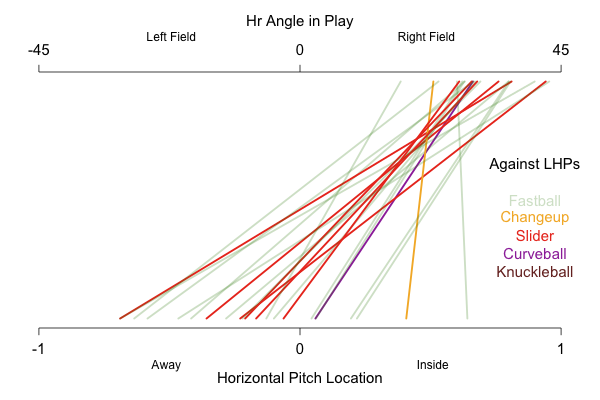 Dave - Very nice graphs of HR location versus pitch location. But something seems wrong. There are many more lines than there are home runs for Pena this year. Are you including HRs from past years? Oh yeah good point Peter. Those are the 85 HRs in the pitchf/x data set. So that includes 39 from 2009, 31 from the 2008 regular season, 3 from the 2008 post season and 12 from the partially covered 2007 season. I should have mentioned that. 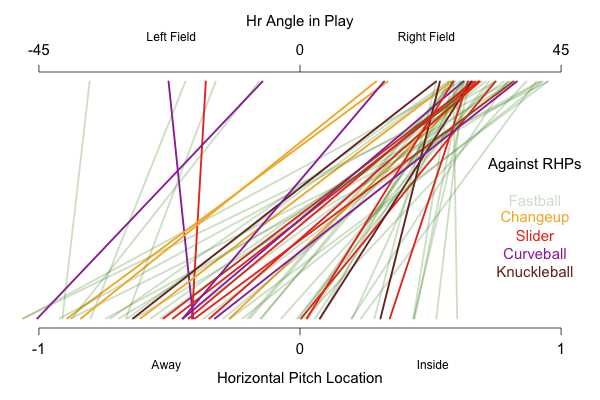 The angle of the ball in play is from the GameDay data which goes back to 2005, so there are additional HRs covered there, but without the pitch data. Alternatively I could, and probably should, have used Greg's more accurate horizontal angles for HR from Hit Tracker, which goes back to 2006. Dave, when I wrote that piece I was looking for a way to graphically display the informations, but I came out empty handed. I'm glad someone else found out exactly what I was looking for.